Australian batsmen Steve Smith and David Warner are likely to leave their respective IPL teams by the end of this month to attend their national training camp from May 2 after being drafted into the squad for the upcoming World Cup. 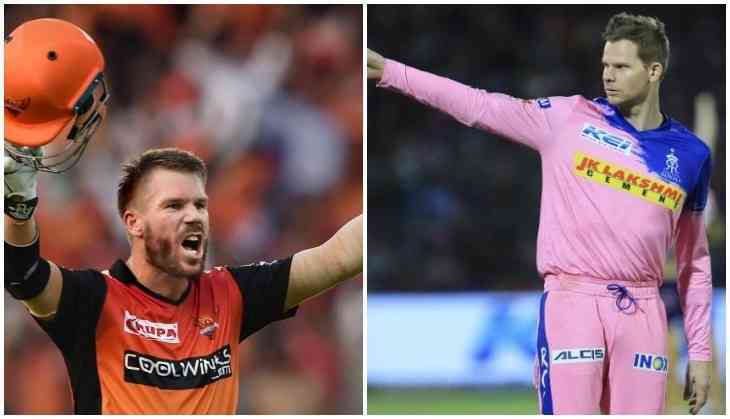 Smith and Warner are currently playing for Rajasthan Royals and Sunrisers Hyderabad respectively in the IPL after serving their 12-month ban for their role in the ball-tampering scandal that rocked Australian cricket last year. The two were recalled to the national team after Australia named their 15-member squad for World Cup beginning May 30 in England and Wales. "The fifteen-player squad for the ICC world cup will assemble in Brisbane for a training camp at the National Cricket Centre on May 2," Cricket Australia said. "The training camp will include three practice matches between Australia XI and New Zealand XI at Allan Border Field." While Warner has been in red-hot form for Sunrisers, holding the orange cap with 400 runs, which includes a century and four fifties, Smith has found the going tough for Rajasthan, having scored just 186 runs in seven matches. They are likely to miss a couple of matches for their respective franchises, besides the knockout stage in case the teams make it to the play-offs. Seamer Jason Behrendorff and all-rounder Marcus Stoinis, who were also named in the World Cup squad, are also expected to leave Mumbai Indians and Royal Challengers Bangalore respectively by the end of the month to attend the camp. While Jason is likely to miss two scheduled Mumbai matches on May 2 and May 5 against SRH and Kolkata Knight Riders, Stoinis might leave a little early considering RCB's dismal run in the IPL this season. Stoinis played a crucial cameo of 28 runs off 16 balls to help RCB register their first win this season when they defeated Kings XI Punjab by eight wickets. RCB will have to win the next seven matches to salvage any chances of making it to the play-offs. The team has just one league match next month against Sunrisers on May 4. Among others, pacer Nathan Coulter-Nile, who also plays for RCB, has already been ruled out of the IPL following an injury and South Africa's Dale Steyn has been drafted into the squad. Australia opens their World Cup title defence against Afghanistan on June 1 in Bristol. Roadies Real Heroes: Gang Leader Sandeep Singh has a surprising thing to say about being a part of the show! READ NEXT >> Roadies Real Heroes: Gang Leader Sandeep Singh has a surprising thing to say about being a part of the show!